I was inspired to do this painting after learning about the Idle No More movement--a movement begun by indigenous peoples of Canada fighting against tar sands oil extraction on and through their land that has now grown to include members all around the world. I was also inspired by lectures about salmon and indigenous rights presented by Chief Caleen Sisk at the University of Oregon in 2013. 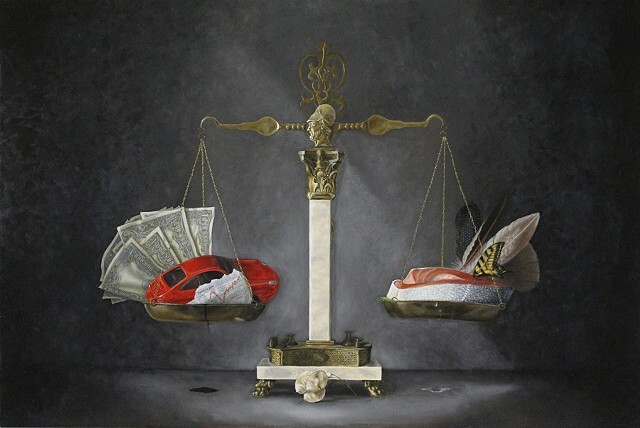 One side of the balancing scale represents the love of money, power, & status symbols, and this side drips with crude oil. On the other side there are representations of nature depicting not only the nature we think we can take for granted, but the vital food sources and clean water we all depend upon.